I hope you will enjoy your Christmas or holiday. I'd just want you to watch this...well this talk about God, and Christmas. I have finaly got my SC! I feel quite good with it. Also, I'll will be hopefuly be able to do stuff now with this blog as I'm now out of school for the next few weeks. Now, I need to do stuff on the web. Heres another clip from Youtube. Well, you can rant on my blog! Okay, if you hate meat, you can rant as much as you like here. and for something that can start the kindle, here's a thingy that you can rant on. Oh, and you can hear a guy talk about podcasting below. well, when you are a blogger, and nothing is happening in your life, (School Certificate - DONE!, Leaving your friend behind who will keep in toutch through Facebook, giving a great talk about worry, going to a study skills sinimar...etc) you have to do a maze. This is copyrighted by puzzlemaker. It's a choice that we all face. I know that some of you are Christain. Others say that there religous, and others say that this is mumbo jumbo. but, the thing is, it's a choice that we have to face. Two ways to live can be found on the right hand page. How else can you stare at an empty canvas and see a work of art?Or sit in silence and hear a song that’s never been written?Or gaze at a red planet and see a laboratory on wheels? Because the people who are crazy enough to thinkthey can change the world, are the ones who do. I was goin to tell you that if you want to help write a good Christan book, and you're on Facebook, check out John Dickson's page, and become friend's. He's now writing a book for non-Christan's telling a short story about Jesus's life. So check it out. I tell you not to worry about your life. Don't worry about having something to eat, drink, or wear. Isn't life more than food or clothing? Well, it been a while since I have been posting. I'll be going away for the Holidays over here in Australia... TO THE GOLD COAST!! Just wanted to say My internet isn't working. Hot dog, We have a winner! Well, Reading the bible is a very important thing to do. we have new addition to the website that is a Verse of the day, (It's above this post) You can get it from Bible Gateway. I'm doing at wonderful Talk at school, on GOD IS STRONG! when posting this, I have no idea what I am doing, but it's going to be cool. The poll that is above this post is very important. This will change this blog. Please look very carfuly at the poll. (On the comments pleese tell me any problems.) I will not post until the poll is finnished. I am a geek, and I listen to podcasts. And there is a expo I would loved to have gone to if i wasn't in school and I was in Australia. There is more than one episode of That Catholic Show! Man: Hey, i found that catholic show so cool! Man: There's more than one episode of That Catholic Show?! you can subscribe if you click on the header! I want to show you some of the best ads that I have ever seen. On You tube. about 1997-98. etc. etc. The rumor is that Steve Jobs (CEO of Apple Inc.) cried when he first saw this ad. After a long search, I have found this. a 2007 version of the Think Different ad. I found another one, but this will work. There has been some changes! Well, I forgot about mothers day on my blog. I hope you enjoyed mothers day. 1 Preheat oven to 240o C. Get tray out. 2 Get a puff pastry sheet out and lightly cover with Egg wash, then lightly cover with the chocolate. Finally cut the square into 5 traingles. 3 Then roll up each triangle from cut end and roll to the point. Then make into a crescent shape. Put on tray. 5 Lightly glaze the croissants with the egg wash. Put the tray in the oven. Bake for 30-35 min. or golden brown. Let it cool for 5mins. Man, I listen to too many podcasts. Most of them are okay, and others really good. Then there is the new podcast, 'That Catholic Show.' Watch it, and post on the comments what you think. In December, a friend asked me to do a prank. He wanted to ask for 4000 lattes. Ichickened out on the spot but did it any way. I asked a friend of mine to do the prank. In January he did it! Just wanted to say that for a while I won't be blogging. dad's computer had a small problem and for a while will be his own workstation. So with that, enjoy your easter! Treat a man as he appears to be, and you make him worse. But treat a man as if he were what he potentially could be, and you make him what he should be. You know, I had a not so good week this week, but one of the things that have happened to me yesterday was that i was sent to the Non-Sport room. Pretty much this could be anything from a good quick few hours of doing not a lot, or a detention. Yesterday it was a detention. We were there for two hours. I've never been to afternoon detention but, I'd believe that they were let off at about 4:30 or so. Now school finishes at 3:15, so it would be 1hr, 15min. Again, we were there for 2 hours! Two Hours! Now I'm only angry of how the teacher made Non-Sport. Non-Sport is not a detention, it's a place go if you stuffed up, but it's also a place for people who can't do sport. I'm angry, but i forgive the teacher. We don't do enough forgiving in this world, and we should do more. let's be strong in our faith, and be more like Jesus. If you know any other good places to go post them on comments! This is also another short blog, but, hey! 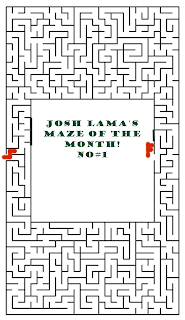 I want to be as mush secretive to the internet as possible, so I'm just Josh Lama. I'm a student in a school in New South Wales, Australia, in yr 10, and a dedicated christrian. I don't have a job, love cricket, and have great friends. that's just a bit about me.